So I come here today to insist that we must never take for granted the progress that has been won here in Europe and advanced around the world, because the contest of ideas continues for your generation. And that’s what’s at stake in Ukraine today. Russia’s leadership is challenging truths that only a few weeks ago seemed self-evident -- that in the 21st century, the borders of Europe cannot be redrawn with force, that international law matters, that people and nations can make their own decisions about their future. To be honest, if we defined our interests narrowly, if we applied a cold-hearted calculus, we might decide to look the other way. Our economy is not deeply integrated with Ukraine’s. Our people and our homeland face no direct threat from the invasion of Crimea. Our own borders are not threatened by Russia’s annexation. But that kind of casual indifference would ignore the lessons that are written in the cemeteries of this continent. It would allow the old way of doing things to regain a foothold in this young century. And that message would be heard not just in Europe, but in Asia and the Americas, in Africa and the Middle East. We've never met these people, but we know them. Their voices echo calls for human dignity that rang out in European streets and squares for generations. Their voices echo those around the world who at this very moment fight for their dignity. These Ukrainians rejected a government that was stealing from the people instead of serving them, and are reaching for the same ideals that allow us to be here today. None of us can know for certain what the coming days will bring in Ukraine, but I am confident that eventually those voices -- those voices for human dignity and opportunity and individual rights and rule of law -- those voices ultimately will triumph. I believe that over the long haul, as nations that are free, as free people, the future is ours. I believe this not because I’m naive, and I believe this not because of the strength of our arms or the size of our economies, I believe this because these ideals that we affirm are true; these ideals are universal. Yes, we believe in democracy -- with elections that are free and fair; and independent judiciaries and opposition parties; civil society and uncensored information so that individuals can make their own choices. Yes, we believe in open economies based on free markets and innovation, and individual initiative and entrepreneurship, and trade and investment that creates a broader prosperity. And, yes, we believe in human dignity -- that every person is created equal, no matter who you are, or what you look like, or who you love, or where you come from. That is what we believe. That’s what makes us strong. And our enduring strength is also reflected in our respect for an international system that protects the rights of both nations and people -- a United Nations and a Universal Declaration of Human Rights; international law and the means to enforce those laws. But we also know that those rules are not self-executing; they depend on people and nations of goodwill continually affirming them. And that’s why Russia’s violation of international law -- its assault on Ukraine’s sovereignty and territorial integrity -- must be met with condemnation. Not because we’re trying to keep Russia down, but because the principles that have meant so much to Europe and the world must be lifted up. Over the last several days, the United States, Europe, and our partners around the world have been united in defense of these ideals, and united in support of the Ukrainian people. Together, we've condemned Russia’s invasion of Ukraine, and rejected the legitimacy of the Crimean referendum. Together, we have isolated Russia politically, suspending it from the G8 nations and downgrading our bilateral ties. Together, we are imposing costs through sanctions that have left a mark on Russia and those accountable for its actions. And if the Russian leadership stays on its current course, together we will ensure that this isolation deepens. Sanctions will expand. And the toll on Russia’s economy, as well as its standing in the world, will only increase. And meanwhile, the United States and our allies will continue to support the government of Ukraine as they chart a democratic course. Together, we are going to provide a significant package of assistance that can help stabilize the Ukrainian economy, and meet the basic needs of the people. Make no mistake: Neither the United States, nor Europe has any interest in controlling Ukraine. We have sent no troops there. What we want is for the Ukrainian people to make their own decisions, just like other free people around the world. Understand, as well, this is not another Cold War that we’re entering into. After all, unlike the Soviet Union, Russia leads no bloc of nations, no global ideology. The United States and NATO do not seek any conflict with Russia. In fact, for more than 60 years, we have come together in NATO -- not to claim other lands, but to keep nations free. What we will do -- always -- is uphold our solemn obligation, our Article 5 duty to defend the sovereignty and territorial integrity of our allies. And in that promise we will never waver; NATO nations never stand alone. Today, NATO planes patrol the skies over the Baltics, and we've reinforced our presence in Poland. And we’re prepared to do more. Going forward, every NATO member state must step up and carry its share of the burden by showing the political will to invest in our collective defense, and by developing the capabilities to serve as a source of international peace and security. Of course, Ukraine is not a member of NATO -- in part because of its close and complex history with Russia. Nor will Russia be dislodged from Crimea or deterred from further escalation by military force. But with time, so long as we remain united, the Russian people will recognize that they cannot achieve security, prosperity and the status that they seek through brute force. And that’s why, throughout this crisis, we will combine our substantial pressure on Russia with an open door for diplomacy. I believe that for both Ukraine and Russia, a stable peace will come through de-escalation -- direct dialogue between Russia and the government of Ukraine and the international community; monitors who can ensure that the rights of all Ukrainians are protected; a process of constitutional reform within Ukraine; and free and fair elections this spring. So far, Russia has resisted diplomatic overtures, annexing Crimea and massing large forces along Ukraine’s border. Russia has justified these actions as an effort to prevent problems on its own borders and to protect ethnic Russians inside Ukraine. Of course, there is no evidence, and never has been, of systemic violence against ethnic Russians inside of Ukraine. Moreover, many countries around the world face similar questions about their borders and ethnic minorities abroad, about sovereignty and self-determination. These are tensions that have led in other places to debate and democratic referendums, conflicts and uneasy co-existence. These are difficult issues, and it is precisely because these questions are hard that they must be addressed through constitutional means and international laws so that majorities cannot simply suppress minorities, and big countries cannot simply bully the small. In defending its actions, Russian leaders have further claimed Kosovo as a precedent -- an example they say of the West interfering in the affairs of a smaller country, just as they’re doing now. But NATO only intervened after the people of Kosovo were systematically brutalized and killed for years. And Kosovo only left Serbia after a referendum was organized not outside the boundaries of international law, but in careful cooperation with the United Nations and with Kosovo’s neighbors. None of that even came close to happening in Crimea. Moreover, Russia has pointed to America’s decision to go into Iraq as an example of Western hypocrisy. Now, it is true that the Iraq War was a subject of vigorous debate not just around the world, but in the United States as well. I participated in that debate and I opposed our military intervention there. But even in Iraq, America sought to work within the international system. We did not claim or annex Iraq’s territory. We did not grab its resources for our own gain. Instead, we ended our war and left Iraq to its people and a fully sovereign Iraqi state that could make decisions about its own future. Of course, neither the United States nor Europe are perfect in adherence to our ideals, nor do we claim to be the sole arbiter of what is right or wrong in the world. We are human, after all, and we face difficult choices about how to exercise our power. But part of what makes us different is that we welcome criticism, just as we welcome the responsibilities that come with global leadership. We look to the East and the South and see nations poised to play a growing role on the world stage, and we consider that a good thing. It reflects the same diversity that makes us stronger as a nation and the forces of integration and cooperation that Europe has advanced for decades. And in a world of challenges that are increasingly global, all of us have an interest in nations stepping forward to play their part -- to bear their share of the burden and to uphold international norms. So our approach stands in stark contrast to the arguments coming out of Russia these days. It is absurd to suggest -- as a steady drumbeat of Russian voices do -- that America is somehow conspiring with fascists inside of Ukraine or failing to respect the Russian people. My grandfather served in Patton’s Army, just as many of your fathers and grandfathers fought against fascism. We Americans remember well the unimaginable sacrifices made by the Russian people in World War II, and we have honored those sacrifices. Since the end of the Cold War, we have worked with Russia under successive administrations to build ties of culture and commerce and international community not as a favor to Russia, but because it was in our national interests. And together, we've secured nuclear materials from terrorists. We welcomed Russia into the G8 and the World Trade Organization. From the reduction of nuclear arms to the elimination of Syria’s chemical weapons, we believe the world has benefited when Russia chooses to cooperate on the basis of mutual interests and mutual respect. So America, and the world and Europe, has an interest in a strong and responsible Russia, not a weak one. We want the Russian people to live in security, prosperity and dignity like everyone else -- proud of their own history. But that does not mean that Russia can run roughshod over its neighbors. Just because Russia has a deep history with Ukraine does not mean it should be able to dictate Ukraine’s future. No amount of propaganda can make right something that the world knows is wrong. In the end, every society must chart its own course. America’s path or Europe’s path is not the only ways to reach freedom and justice. But on the fundamental principle that is at stake here -- the ability of nations and peoples to make their own choices -- there can be no going back. It’s not America that filled the Maidan with protesters -- it was Ukrainians. No foreign forces compelled the citizens of Tunis and Tripoli to rise up -- they did so on their own. From the Burmese parliamentarian pursuing reform to the young leaders fighting corruption and intolerance in Africa, we see something irreducible that all of us share as human beings -- a truth that will persevere in the face of violence and repression and will ultimately overcome. Op 1 en 2 april a.s. komen de ministers van Buitenlandse Zaken van de NAVO-landen bijeen in Brussel. De conceptagenda voorziet in een werksessie, een bijeenkomst met Oekraïne (NAVO-Oekraïne Commissie) en een werkdiner op 1 april. Op 2 april komt de NAVO bijeen met Georgië (NAVO-Georgië Commissie), de ISAF-partners en de landen van het Istanbul Cooperation Initiative (ICI). Ook is een reeds eerder geplande, korte, ceremoniële bijeenkomst voorzien ter gelegenheid van de uitbreiding van de NAVO in 1999, 2004 en 2009. De situatie in Oekraïne zal de besprekingen domineren. Voor zover mogelijk zal ook worden vooruitgeblikt naar de NAVO-top op 4 en 5 september in Wales. In deze brief wordt vooral ingegaan op de Nederlandse positie in de NAVO t.a.v. het Russisch-Oekraïense conflict. De afgelopen weken bent u meerdere malen geïnformeerd over de ontwikkelingen in Oekraïne. In de brieven aan uw Kamer d.d. 3, 7, 12 en 18 maart is ook ingegaan op de besprekingen die binnen de NAVO zijn gevoerd. Zoals uit deze berichtgeving blijkt, volgt de NAVO de situatie nauwgezet en heeft zij de bestaande samenwerkingsverbanden met Oekraïne en Rusland, respectievelijk de NAVO-Oekraïne Commissie (NUC) en de NAVO-Rusland Raad (NRR), benut om de kwestie te bespreken. Op 14 maart jl. kwam de Euro-Atlantische Partnerschapsraad (EAPR), waarin Oekraïne en Rusland zitting hebben, bijeen. De NAVO heeft, o.a. in verklaringen op 2, 4 en 17 maart de Russische handelwijze in krachtige termen veroordeeld en het land opgeroepen zijn internationale verplichtingen na te komen. Helaas hebben ook de besprekingen in de NRR er niet toe geleid dat Rusland is overgegaan tot de-escalatie van de situatie. Op 4 maart jl. kwam de Noord Atlantische Raad (NAR) bijeen op verzoek van Polen. Polen had artikel 4 ingeroepen, dat stelt dat bondgenoten onderling overleg zullen plegen wanneer naar de mening van een van hen de territoriale integriteit, politieke onafhankelijkheid of veiligheid van een der partijen wordt bedreigd. Bij die gelegenheid heeft de NAR besloten tot het treffen van maatregelen om de situational awareness van het Bondgenootschap rond de situatie in Oekraïne te verbeteren. Dat houdt onder andere in dat de AWACS-toestellen actiever boven het grondgebied van de Alliantie worden ingezet. In dit kader zal, in overleg met de minister van Defensie, ook Nederlandse tankercapaciteit (air-to-air refueling) worden ingezet ten behoeve van het bijtanken van deze AWACS-toestellen.De hiermee gemoeide kosten zullen worden gedekt binnen het Defensie-budget. Zoals bericht, besloot de NAR ook tot versterking van de samenwerking met Oekraïne binnen het raamwerk van de NUC en tot een herziening van de relaties met Rusland. Tijdens de ministeriële bijeenkomst op 1 en 2 april zal bezien worden hoe deze besluiten geconcretiseerd kunnen worden en of aanvullende maatregelen noodzakelijk zijn. Conform de Nederlandse inzet heeft ook de NAVO zich er vanaf het begin op gericht om verdere escalatie van de situatie te voorkomen. Helaas hebben oproepen aan Rusland hiertoe geen positief effect gesorteerd. Integendeel, de Russische handelwijze heeft ervoor gezorgd dat verschillende bondgenoten zich in toenemende mate zorgen maken over de veiligheidsconsequenties van het Russische handelen en gevraagd hebben om zichtbare reassurance. Voor Nederland vormt dit element van reassurance een onlosmakelijk onderdeel van de onderlinge solidariteit die het fundament is van het Bondgenootschap. De tot op heden door de NAVO getroffen maatregelen in deze crisis passen volgens Nederland goed in het vinden van een balans tussen de behoefte aan reassurance en de wens tot de-escalatie. Ministers zullen spreken over de meest recente ontwikkelingen als ook over de strategische implicaties daarvan voor het Bondgenootschap. Tijdens de NAVO-bijeenkomst zal voorts worden gesproken over verdere steun die aan Oekraïne kan worden gegeven in het kader van de bestaande partnerschapsovereenkomst met het land. Het land vormt een belangrijke partner van de NAVO en bezien zal moeten worden hoe aan het hierboven gemelde besluit om de samenwerking met Oekraïne te versterken, invulling kan worden gegeven. Nederland denkt hierbij met name aan NAVO-bijdragen bij de hervorming en professionalisering van het Oekraïense leger en assistentie m.b.t. de democratische controle over de krijgsmacht. Daar Oekraïne geen lid is van de NAVO, is van veiligheidsgaranties vanuit het Bondgenootschap voor Oekraïne geen sprake. De NAVO zal stilstaan bij de gevolgen van het conflict voor de relatie met Rusland. Zoals gemeld, besloot de NAVO op 5 maart tot een herziening van de relatie met Rusland. Tevens werd besloten om tot de ministeriële bijeenkomst op 1 en 2 april geen ontmoetingen op werkniveau meer te houden. Nederland is van mening dat Rusland een belangrijke partner van de NAVO is waarmee het Bondgenootschap essentiële belangen deelt, waaronder de bestrijding van terrorisme en de aanpak van piraterij. In deze crisis heeft Rusland echter het internationale recht op ernstige wijze geschonden. Dat kan niet zonder gevolgen blijven voor de relatie van de NAVO met Rusland. Op welke terreinen dit vorm gegeven zal worden, is onderwerp van discussie. Nederland zal zich er wel voor inzetten dat de diplomatieke kanalen voor politieke dialoog ook in NAVO-kader zoveel mogelijk open blijven. Op 2 april zal de NAVO-Georgië Commissie (NGC) bijeenkomen. Met minister Panjikidze zal worden gesproken over de ontwikkelingen in Georgië en mogelijkheden om de samenwerking met het land te intensiveren. Zoals bekend, wil Georgië graag lid worden van de NAVO. Georgië zou graag zien dat tijdens de NAVO-Top in september het lidmaatschapsperspectief, dat de NAVO Georgië in 2008 bood, wordt ingevuld door een concrete stap voorwaarts. Nederland verwelkomt de Euro-Atlantische aspiraties van Georgië en de voortgang die het land maakt. Nederland heeft waardering voor de omvangrijke bijdrage van Georgië aan de ISAF-operatie. De vraag doet zich voor in hoeverre de ontwikkelingen in Oekraïne gevolgen moeten hebben voor de NAVO-toetredingskandidatuur van Georgië. Nederland is van mening dat Georgië op zijn eigen merites dient te worden beoordeeld. De mate waarin Georgië politieke en militaire hervormingen ter hand neemt en bijdraagt aan de Euro-Atlantische veiligheid moet leidend zijn. Voorkomen moet worden dat voeding wordt gegeven aan het zero sum-spel dat ogenschijnlijk door Rusland wordt gespeeld. Nederland wacht met interesse de voortgangsrapportages van de SG NAVO af over de vier landen met lidmaatschapsaspiraties. Deze rapportages zullen in juni tijdens de volgende NAVO-bijeenkomst op het niveau van de ministers van Buitenlandse Zaken worden besproken. De ministers van Buitenlandse Zaken zullen in ISAF-samenstelling met de Afghaanse autoriteiten van gedachten wisselen. Dit is de laatste ISAF- bijeenkomst voor de presidentsverkiezingen in Afghanistan op 5 april. Naar alle waarschijnlijkheid zal gesproken worden over de politieke en veiligheidssituatie aan de vooravond van de verkiezingen. Ook zal mogelijk kort gesproken worden over de nog lopende onderhandelingen over de Status of Forces Agreement (SOFA) met de NAVO en het uitblijven van overeenstemming over de Bilateral Security Agreement (BSA) met de Verenigde Staten. Ter gelegenheid van het 10-jarig bestaan zal de NAR met de landen van het Istanbul Cooperation Initiative (ICI) bijeenkomen. Op de NAVO-top in Istanbul (2004) werd besloten tot oprichting van het ICI. Het ICI is primair gericht op de landen op het Arabische Schiereiland. Inmiddels zijn Koeweit, Bahrein, de Verenigde Arabische Emiraten en Qatar toegetreden. Oman en Saoedi-Arabië zijn uitgenodigd, maar hebben nog geen toetredingswens kenbaar gemaakt. Het ICI richt zich vooral op praktische samenwerking. Nederland acht het ICI een nuttig forum voor samenwerking met deze landen en ziet mogelijkheden om op bepaalde terreinen, bijvoorbeeld piraterijbestrijding en de politieke dialoog, de samenwerking te intensiveren. Het afgelopen jaar heeft Defensie voor de eerste keer een NH-90 succesvol operationeel ingezet tijdens de anti-piraterijmissie voor de kust van Somalië. Na terugkeer van de helikopter is een periodieke inspectie uitgevoerd, waarbij bovenmatige corrosie en slijtage zijn aangetroffen. Bij de helikopter die eind vorig jaar is ingezet aan boord van Zr.Ms. Amsterdam in het Caribisch gebied, zijn vergelijkbare constateringen gedaan. De corrosie en slijtage die zijn aangetroffen, zijn groter dan op grond van de ouderdom van de helikopter, het aantal vlieguren en ervaringen met andere maritieme helikoptertypen zou mogen worden verwacht. Vanwege het specialistische karakter van de problematiek heeft Defensie het Nationaal Lucht- en Ruimtevaart Laboratorium (NLR) om hulp gevraagd bij het onderzoeken van de problematiek en het in kaart brengen van de gevolgen. Vooralsnog lijkt zowel het corrosieprobleem als de bovenmatige slijtage vooral te worden veroorzaakt door ontwerpfouten, assemblagefouten en incomplete onderhoudsinstructies. 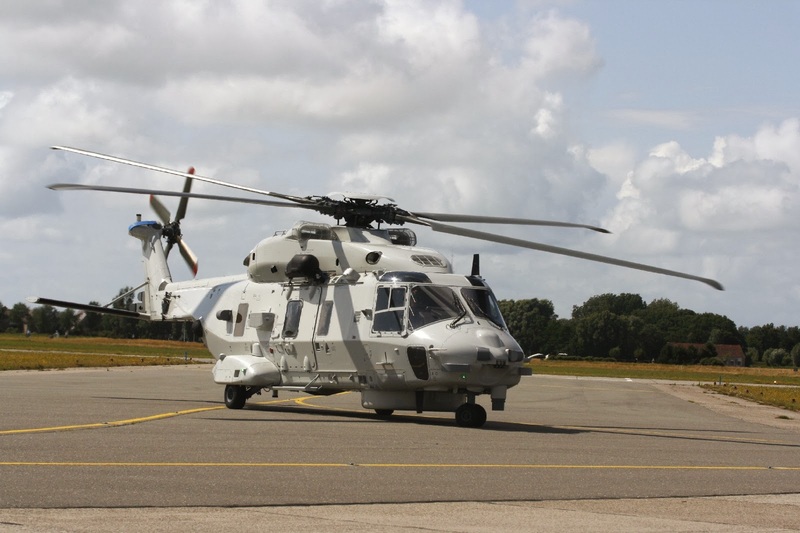 Het is dan ook waarschijnlijk dat zich soortgelijke problemen zullen voordoen bij andere NH-90 helikopters die aan boord van schepen worden ingezet. Defensie heeft al intensief contact met de fabrikant (NHI) om oplossingsrichtingen te bekijken. NHI heeft de problemen erkend en te kennen gegeven volop bezig te zijn met het bedenken van oplossingen. NHI verwacht de eerste resultaten daarvan eind maart beschikbaar te hebben. Dat zal gaan om technische verbeteringen en een corrosiepreventieprogramma. Overige voorstellen voor oplossingen zullen naar verwachting later dit jaar volgen. De fabrikant is gemeld dat een verbeterd ontwerp wordt verwacht voor de onderdelen die bovenmatige slijtage vertonen. De problemen moeten immers structureel kunnen worden opgelost. Defensie onderzoekt ook of en op welke wijze de geconstateerde ontwerp- en fabricagefouten op de fabrikant kunnen worden verhaald. Defensie heeft de geconstateerde problemen ook kenbaar gemaakt aan het NATO Helicopter Management Agency (Nahema) en de NH-90 partnerlanden. Frankrijk heeft tot nu toe bij twee helikopters corrosie aangetroffen en met dat land zijn inmiddels afspraken gemaakt om de problemen gezamenlijk bij de fabrikant aan de orde te stellen. Italië is pas recent met boordoperaties gestart. Ook met andere landen wordt overlegd over de geconstateerde problemen en de positie ten opzichte van de industrie. • De juridische gevolgen, onder meer met betrekking tot de financiële verantwoordelijkheid, worden bekeken in overleg met de Directie Juridische Zaken, de Defensie Materieel Organisatie en de Hoofddirectie Financiën en Control. De geschetste problematiek heeft geen operationele consequenties voor de voorgenomen inzet in 2014. Eventuele (operationele) consequenties daarna volgen uit het lopende onderzoek van de Commandant der Strijdkrachten. De komende twee maanden zullen nodig zijn voor het onderzoek van het NLR en het opmaken van het schadebeeld samen met andere landen. Ook het onderzoek van de Commandant der Strijdkrachten zal naar verwachting één tot twee maanden in beslag nemen. Ik verwacht eind april meer zicht te hebben op de aard en omvang van het probleem. Daarna zal ik u nader informeren. Graag nodig ik de leden van de vaste commissie voor Defensie uit voor een bezoek aan het Defensie Helikopter Commando, om zelf van gedachten te wisselen met bemanningsleden en onderhoudspersoneel. "Opeens zie ik een fantastische James Bondfilm waarin de Nederlandse koning samen met de Britse geheim agent actie onderneemt om een stukje tuin te heroveren. Of onze minister van Defensie een rolletje krijgt? Ik denk dat ik haar de hele film met Onno Hoes en Plasterk in Maastricht de polonaise laat lopen. Want dat deed ze afgelopen weekend. Het was tenslotte carnaval. Je hebt hoofdzaken en bijzaken. Dat Hoes en Plasterk na een turbulente periode aan een verzetje toe waren snap ik, maar wat deed onze Jeanine daar? Op dat moment staarde de legertop in opperste staat van paraatheid naar de telefoon. Obama kon ieder moment bellen. De hele wereld hield zijn adem in. Vliegdekschepen zetten al voorzichtig koers richting de Zwarte Zee. Mensen vroegen zich af of ze al moesten gaan hamsteren. En wat deed Jeanine? Die zette zich op een selfie met Albert Verlinde." As Commander of the Royal Netherlands Navy I am extremely grateful for being able to welcome this Joint Support Ship as newcomer to our fleet. It is a marvellous ship, highly capable, much needed and with great potential for International cooperation. I am pleased to see many representatives of our international partners. I am looking forward to explore bilateral, multilateral and international ways to deploy this ship together with you. De doop van een schip wordt traditioneel door een vrouw verricht. Maar dat dit vandaag, op ‘Internationale Vrouwendag’, gebeurt, maakt het extra bijzonder. Ik wil u bedanken dat u deze doop heeft verricht, maar vooral ook danken voor het belangrijke werk dat u in de afgelopen periode voor de krijgsmacht heeft gedaan. Onder uw bewind lijkt het spreekwoordelijke tij gekeerd, voor wat betreft de jarenlange bezuinigingen op defensie. Een bijdrage waar ik u zeer dankbaar voor ben. Dankzij uw inspanning heeft Defensie dit schip kunnen behouden. Afgelopen week heb ook ik Indonesië bezocht. Ik heb daar, voor het eerst in de historie, samen met mijn Indonesische ambtsgenoot een krans mogen leggen bij de herdenking van de Slag om de Java zee. Als je daar staat, op vijfentwintig uur vliegen van hier, dan realiseer je je hoe groot de offers zijn die daar werden gebracht. Meer dan tweeduizend zeelieden lieten daar in één zeeslag het leven, daaronder Karel Doorman en zijn 915 Nederlandse en Indonesische bemanningsleden. Schout-bij-nacht Karel Doorman voerde een heroïsche maar ook een zeer ongelijke strijd. Omdat de tegenstander technologisch superieur was. Daarom is het zo belangrijk dat we blijven investeren in de marine; maar bovenal dat we blijven innoveren. De Karel Doorman is het voorbeeld van zo’n innovatie. Achter mij ligt een bijzonder schip. Een schip dat exemplarisch is voor de ‘high tech’ Nederlandse maritieme industrie. Dankzij onze intensieve samenwerking met industrie en kennisinstituten (gouden driehoek) zijn wij in staat om als ‘benchmark navy’ te opereren. De Nederlandse scheepsbouwindustrie heeft met de Karel Doorman dan ook een topprestatie geleverd. Nooit eerder heeft de marine zo’n groot schip in de vaart genomen. Het schip is niet alleen groot, het is een operationele alleskunner. Het is in staat om vlootverbanden op zee te bevoorraden, het kan worden ingezet voor strategisch transport, het kan fungeren als een logistieke basis op zee (Sea Basing), het is een drijvend hospitaal en uitermate geschikt voor humanitaire hulpverlening. Met zijn geïntegreerde mast, dezelfde mast treft u aan op de Oceangoing Patrol Vessels, kan de Doorman grote zeegebieden bewaken. Als helikopterplatform en met haar snelle boten kan het schip ook worden ingezet voor maritieme veiligheidsoperaties. En dit alles met een relatief kleine bemanning. We doen dat niet alleen, want sinds jaar en dag werken we samen in internationaal verband, dat zit in onze genen. Er bestaat al een Europees ‘Movement Coordination Centre’, dat de gemeenschappelijke militaire goederenstromen over zee coördineert. Er is een ‘European Amphibious Initiative’ waar in Europees verband amfibische initiatieven worden genomen, er is ook een ‘European Carrier Battle Group’ initiative. De internationale vlootverbanden die het gevolg zijn van deze initiatieven, moeten natuurlijk logistiek worden ondersteund! Daarvoor is dit schip bij uitstek geschikt. Ook de Verenigde Naties kennen vele samenwerkingsvormen voor humanitaire en militaire inzet. Binnen de NAVO is grote behoefte aan deze niche capaciteit. Binationaal zijn er diverse verbanden, waarvan het Belgisch Nederlandse ABNL en de Britse Nederlandse UKNL samenwerking veruit het meest bekend zijn. En niet voor niets draagt dit schip in haar naam ‘joint*’, van Joint Support Ship. Voldoende ‘kapstokken’ dus waaraan dit schip kan worden opgehangen. Karel Doorman zou trots zijn geweest als hij had geweten dat zijn naam aan dit bijzondere schip zou worden gekoppeld. Haar mogelijkheden zijn ongekend en voor velen nog onbekend. Daarin zal snel verandering komen, want dit schip gaat de harten van de internationale maritieme wereld stelen. Daar ben ik van overtuigd. Tenslotte… Wat een megaproject: zonder bouwers, projectleiders, planners, leveranciers, onderleveranciers en nog veel meer was dit schip er niet gekomen. Hier is een stuk vakwerk afgeleverd; mijn bemanning gaat nu toewerken naar de indienststelling. We kunnen niet wachten ‘Zijner Majesteits’ toe te voegen aan deze Karel Doorman. Ik heb net een applaus gevraagd voor de minister, maar ik wil u nu nogmaals vragen om dat te doen voor alle mannen en vrouwen die dit schip hebben ontworpen en gebouwd en er nog hard mee bezig zijn. * 'joint' = voor meerdere krijgmachtsonderdelen , bijv. landmacht + marine etc. Door de Minister van Defensie, Jeanine Hennis-Plasschaert op 8 maart 2014 te Vlissingen. Let op: Alleen het gesproken woord geldt! First of all I would like to express my sincere gratitude to Mr Van Ameijden. 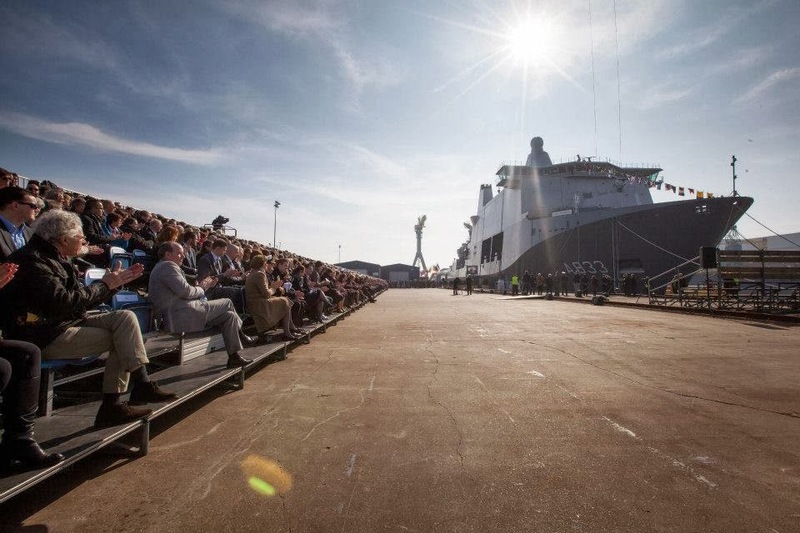 Mr Van Ameijden, thank you so much…for hosting this ceremony today, here at Damen Schelde Naval Shipbuilding in Vlissingen. …And today is a special day because we are naming a marvellous new ship of the Royal Netherlands Navy. For Damen Schelde Naval Shipbuilding’s achievement proves that Dutch shipbuilding can still be counted among the best in the world. Please allow me to continue in Dutch. Zojuist is gedoopt het Joint Support Ship de Karel Doorman. En wat ben ik trots dat dit schip - vanaf vandaag - als de Karel Doorman door het leven gaat. Mét dit schip voegen we een mooi en inspirerend hoofdstuk toe aan de rijke geschiedenis van onze Koninklijke Marine. Een historie waarin Schout-bij-nacht Karel Doorman een bijzondere bladzijde inneemt. Vorig jaar oktober bracht ik een bezoek aan Indonesië. …Hét monument dat herinnert aan de Slag in de Javazee op 27 februari 1942. …Hét monument dat herinnert aan zijn fameuze woorden ‘All ships follow me’. …Hét monument dat herinnert aan de 915 Nederlandse en inheemse marinemannen die daar - op die tragische dag - om het leven kwamen. De dag daarvoor verzamelde Karel Doorman zijn vloot in de marinehaven Oedjoeng op Soerabaja. Daar ontving hij zijn instructies: Terugtrekken is geen optie, houd stand tegen de Japanse eskaders. Ik heb op die bewuste granieten trap gestaan. De trap waar Karel Doorman zijn laatste stappen op het vaste land zette. …probeerde ik me voor te stellen hoe Doorman zich gevoeld moest hebben. Hij wist dat de kans op een overwinning klein was. Dat moment op die trap heb ik als bijzonder indrukwekkend ervaren. Voor heel even leek de geschiedenis tot leven te komen. Karel Doorman voerde zijn opdracht uit. De afloop is ons allen bekend. Hij zou niet terug keren. Zijn moed en onverschrokkenheid spreken tot op de dag van vandaag tot de verbeelding. En ik beschouw het dan ook als zeer terecht…dat een indrukwekkend schip als dit…de naam van Karel Doorman draagt. En indrukwekkend is het Joint Support Ship! Het is het grootste schip dat ooit voor de Nederlandse Koninklijke Marine is gebouwd. …10.000 ton staal… is anderhalve Eiffeltoren! …is het meer dan passend om ook even stil te staan bij het belang van goed uitgeruste Zeestrijdkrachten. Handelsnatie Nederland vaart immers wel bij een sterke krijgsmacht, bij de inzet van onze Koninklijke Marine. Onze economie is voor zo’n 70 procent afhankelijk van handel. Zo is Nederland groot geworden. En dat zal in de toekomst niet anders zijn. Onze grootste kracht maakt ons echter ook kwetsbaar. We zijn gevoelig voor allerhande crises. …niet zelden raakt het onze portemonnee - vroeg of laat - rechtstreeks. Ter bevordering van die, voor ons zo noodzakelijke, internationale veiligheid en stabiliteit voeren we een actief buitenlands beleid. Niet naar binnen gericht, maar naar buiten – over de dijken heen! …is een vrije doorvaart cruciaal. En dat geldt ook voor een gegarandeerde toegang tot kusten en havens. De krijgsmacht, onze Koninklijke Marine, levert hier een belangrijke bijdrage aan. Sterker nog, de Koninklijke Marine is onmisbaar in dezen. De afgelopen twee decennia waren verre van makkelijk voor Defensie. Bezuinigingen en reorganisaties volgden elkaar in rap tempo op. Ook 2013 was een bewogen jaar. Een jaar van herijken en knopen doorhakken. Om een militair relevante krijgsmacht - ook voor de toekomst - te borgen, was een zorgvuldige afweging aan de orde. Medio oktober volgde dan eindelijk een beetje goed nieuws. De nieuwe begrotingsafspraken pakten positief uit voor Defensie. Het gevolg hiervan was dat we in staat werden gesteld om enkele zeer pijnlijke maatregelen terug te draaien dan wel te verzachten. En dat was ook broodnodig! Want laat één ding helder zijn: een relevante, robuuste en responsieve krijgsmacht is…in het belang van Nederland! Het Joint Support Ship kon alsnog in de vaart worden genomen. En de opluchting was groot. Nationaal. Want, let wel, in NAVO- en EU-verband vormt dit schip een belangrijke niche-capaciteit. En ook daarom vind ik het passend dat dit schip de naam van Karel Doorman draagt. Doorman voerde het American British Dutch Australian Command aan. Hij was daarmee één van de eerste vlootcommandanten die zo nadrukkelijk in internationaal verband opereerde. En met dit schip kunnen we verder vorm geven aan die - voor ons - zo belangrijke internationale samenwerking. Met dit schip kunnen we dus ook verder vorm geven aan het vergroten van ons militaire handelingsvermogen. En daarmee is de Karel Doorman één van de visitekaartjes van ons Koninkrijk. Ook beschouw ik de Karel Doorman als een mooi voorbeeld van wat de gouden driehoek, de samenwerking tussen kennis, industrie en Defensie, ons kan opleveren. Graag wil ik u, tot slot, nog even meenemen naar een moment medio februari 2013. Samen met Admiraal Borsboom bezocht ik onze Mariniers in Noorwegen. Zij ondergaan daar de Arctic-Training. Een extreme training onder extreem koude omstandigheden. We arriveerden op Valentijnsdag in Harstad. De nacht zou ik doorbrengen in een sneeuwhol. Maar niet voordat we eerst even een aantal zaken hadden doorgenomen. Ook moest er nog gegeten worden. En mijn adjudant had hiervoor een tafeltje gereserveerd in een lokaal restaurant. Het was de avond dat ik werd gevraagd om de Karel Doorman te dopen. Het voelde als een aanzoek. En zo is het eigenlijk ook. Ik ga hiermee immers een verbintenis aan voor het leven! Er ligt hier een geweldig schip, met een bemanning die liever vandaag dan morgen zou willen uitvaren! uw inzet en deskundigheid zijn uiteindelijk cruciaal voor het slagen van de missies die we met de Karel Doorman gaan ondernemen. Ik heb daar in ieder geval heel veel vertrouwen in. Ik voel me, en zeker nu als doopster, zeer met u verbonden! Dat spreekt voor zich. Ik wens u een behouden vaart. Ik wens u - in de geest van Karel Doorman - de moed om op te staan, de vastberadenheid om te strijden voor veiligheid, vrijheid en welvaart. I present to you… the Joint Support Ship Karel Doorman! …for use in both - national and international - contexts. Obviously, I would like to congratulate the Royal Netherlands Navy on this latest addition to its assets. And I am absolutely certain that it will make us all proud to see the Karel Doorman flying the Dutch Red, White and Blue – our nation’s flag. …That it will makes us all proud to watch the Karel Doorman sailing in the Caribbean Sea, in the waters off Somalia or - for example - in our own beloved North Sea. Op 13 januari jl. heeft de Kamer mijn antwoorden ontvangen op de schriftelijke vragen van de leden Segers en Voordewind (beiden Christen Unie) en van het lid Vuijk (VVD) over de gevechtskleding voor de missie naar Mali (Aanhangsel van de Handelingen, vergaderjaar 2013-2014, nr. 914). Graag stuur ik u in aanvulling op die antwoorden nieuwe informatie over de uitrusting van de Nederlandse speciale eenheden in die missie. In de antwoorden op bovengenoemde vragen schrijf ik dat voor de missie naar Mali geen nieuwe gevechtskleding is aangeschaft. Bij de speciale eenheden bestaat echter de behoefte om, net als destijds in Afghanistan, een aangepast kledingpakket te gebruiken. Het betreft een zogenaamd multicam uniform, dat speciaal is gemaakt voor optreden onder extremere omstandigheden. Gezien de verwachte terrein- en weersomstandigheden en de uit te voeren taak waarbij langdurig meerdaags optreden onder extreme omstandigheden te verwachten is, past het aangepaste kledingpakket goed bij het beoogde optreden van de speciale eenheden. Van deze kleding heeft Defensie voor inzet in Afghanistan een kleine hoeveelheid aangeschaft, waarvan geen bruikbare voorraad meer resteert. Daarom zijn voorbereidingen getroffen voor de verwerving van nieuwe kleding. Ik acht het van belang u hierover te informeren omdat Defensie nu wel kleding ontvangt die is gemaakt van de stof Defender M.
Omdat voor deze kledingbehoefte geen raamcontract bestond, moest het KPU-bedrijf de nieuwe gevechtskleding aanbesteden. Daarvoor heeft het KPU-bedrijf een korte marktverkenning gedaan. Voorafgaand aan de marktverkenning is binnen Defensie overleg gevoerd over de eisen waaraan deze kleding moest voldoen. Daarbij is gebruik gemaakt van een concept behoeftestelling voor gevechtskleding voor speciale eenheden waarin hogere eisen worden gesteld, onder andere aan vlamwerendheid, insectenwerendheid en draagbaarheid. Hoewel deze behoeftestelling nog niet is vastgesteld door de Commandant der Strijdkrachten, zijn deze eisen dus wel het uitgangspunt geweest bij de aanschaf waarover we nu spreken. Uit de marktverkenning van het KPU-bedrijf bleek dat twee leveranciers de kleding binnen de gevraagde termijn konden leveren. Beide leveranciers konden verschillende stoffen leveren. Alleen van de stof Defender M van de firma Ten Cate waren certificaten beschikbaar die aantoonden dat aan de eisen wordt voldaan. Met het oog op de start van de missie in Mali ontbrak de tijd voor nader onderzoek naar de overige stoffen. Momenteel wordt kleding aangeschaft voor enkele rotaties speciale eenheden. Zodra dat nodig is zal de voorraad worden aangevuld. Besloten is de kleding tijdens de missie in Mali in het kader van Concept Development & Experimentation (CD&E) te evalueren. De uitkomsten daarvan worden meegenomen in de behoeftestelling voor het project Defensie Operationeel Kledingsysteem (DOKS), waarin Defensie de vervanging van alle gevechtskleding voorbereidt. Sinds het einde van de Koude Oorlog bestond er in Europa een sluimerend meningsverschil over de vraag in hoeverre Rusland, als erfgenaam van de Sovjet-Unie, nog een werkelijke bedreiging vormde. In West-Europese landen als Nederland maakte men zich daar geen grote zorgen over. Maar in de landen die na de Tweede Wereldoorlog onder de verstikkende dominantie van Moskou hebben geleden, of zelfs deel hebben uitgemaakt van de Sovjet-Unie, bleef de vrees voor het grote Rusland altijd levend. Toetreding tot de NAVO was daarom voor die landen van enorm belang. Met de inval in Oekraïne, die voorlopig heeft geleid tot de militaire bezetting van de Krim, heeft president Poetin de Polen, de Balten en hun geestverwanten in hun angstige overtuiging bevestigd. Blijkbaar eigent Moskou zich ook bijna een kwart eeuw na het einde van de Sovjet-Unie nog het recht toe om een land binnen te vallen dat het tot zijn invloedssfeer rekent. Niet alleen schendt Rusland daarmee het volkenrecht en de garanties die het twintig jaar geleden zélf aan het soevereine Oekraïne heeft verstrekt. Het riskeert met deze operatie in het intens verdeelde en instabiele land ook een bittere oorlog te ontketenen. Er is weinig fantasie voor nodig, en een klein beetje historische kennis, om te beseffen hoe bloedig dat kan eindigen en hoe ontwrichtend dat kan werken in de hele regio. De bezetting van de Krim en de dreigementen van president Poetin en het Russische parlement om het daarbij niet te laten, brengen de vrede en veiligheid in Europa in gevaar, zoals secretaris-generaal Rasmussen van de NAVO gisteren terecht zei. Oekraïne is geen lid van de NAVO, het bondgenootschap heeft dus ook niet te verplichting om het aangevallen land te hulp te schieten in zijn confrontatie met (kernmacht) Rusland. Iedere militaire escalatie van het conflict moet nu ook dringend vermeden worden. Wel is het belangrijk dat zo veel mogelijk landen, en dus niet alleen het Westen, Rusland krachtig duidelijk maken dat deze interventie volstrekt onverantwoordelijk en onacceptabel is. Het dreigement om Rusland als sanctie diplomatiek, politiek en mogelijk ook economisch te isoleren is daarbij een van de weinige beschikbare instrumenten, en mag niet onbenut blijven. Tegelijk is een grote diplomatieke inspanning nodig, om te voorkomen dat de toestand verder uit de hand loopt. Een balans te vinden tussen harde afkeuring van de Russische operatie enerzijds en het opzoeken van de dialoog anderzijds is de moeilijke opdracht waar de internationale diplomatie nu voor staat. De Europese Unie, die grenst aan Oekraïne, moet daarbij een hoofdrol spelen. Wat drie maanden geleden begon als een intern oproer in Oekraïne is dit weekeinde in rap tempo uitgegroeid tot de grootste crisis in Europa sinds de val van de Berlijnse Muur en het einde van de Koude Oorlog. Door annexatie van de Krim en een dreigende inval in andere delen van Oekraïne, lapt Rusland het Handvest van de Verenigde Naties aan de laars. Secretaris-generaal Rasmussen van de NAVO brandmerkt de Russische president Poetin terecht als agressor. De vraag is echter in hoeverre het Westen in staat is het Russische gevaar het hoofd te bieden. Poetin trok zich volstrekt niets aan van de waarschuwing van de Amerikaanse president Obama dat een inval in Oekraïne een prijs zou hebben. Een pijnlijke nederlaag voor Obama die al danig verzwakt is op het wereldtoneel, omdat hij in de Syrië-crisis niet de daad bij het woord voegde. Eerder afgesloten akkoorden omtrent de soevereiniteit en territoriale integriteit van Oekraïne blijken niets waard. Dit terwijl Poetin niet nalaat interventies van het Westen telkens te veroordelen als schendingen van het internationale recht. Te midden van angstaanjagende Koude Oorlogstaal hamert Moskou op het recht om etnische burgers te beschermen. Onheilspellende parallellen dringen zich op met de situatie in Europa aan de vooravond van de Tweede Wereldoorlog toen Hitler het Duitssprekende Sudetenland in Tsjecho-Slowakije annexeerde. Als de geschiedenis iets heeft aangetoond is het wel dat niet gebogen moet worden voor een agressor. De NAVO zal met een daadkrachtiger antwoord moeten komen op de oorlogsmachine van Poetin. Alle alarmbellen moeten nu afgaan in het NAVO-hoofdkwartier. The North Atlantic Council condemns the Russian Federation’s military escalation in Crimea and expresses its grave concern regarding the authorisation by the Russian Parliament to use the armed forces of the Russian Federation on the territory of Ukraine. Military action against Ukraine by forces of the Russian Federation is a breach of international law and contravenes the principles of the NATO-Russia Council and the Partnership for Peace. Russia must respect its obligations under the United Nations Charter and the spirit and principles of the OSCE, on which peace and stability in Europe rest. We call on Russia to de-escalate tensions. We call upon the Russian Federation to honor its international commitments, including those set out in the Budapest Memorandum of 1994, the Treaty on Friendship and Cooperation between Russia and Ukraine of 1997, and the legal framework regulating the presence of the Russian Black Sea Fleet, to withdraw its forces to its bases, and to refrain from any interference elsewhere in Ukraine. We urge both parties to immediately seek a peaceful resolution through bilateral dialogue, with international facilitation, as appropriate, and through the dispatch of international observers under the auspices of the United Nations Security Council or the Organization for Security and Cooperation in Europe (OSCE). Ukraine is a valued partner for NATO and a founding member of the Partnership for Peace. NATO Allies will continue to support Ukrainian sovereignty, independence, territorial integrity, and the right of the Ukrainian people to determine their own future, without outside interference. We emphasise the importance of an inclusive political process based on democratic values, respect for human rights, minorities and the rule of law, which fulfills the democratic aspirations of the entire Ukrainian people. We met today, at Ukraine’s request, to consult in the NATO-Ukraine Commission. We intend to engage with Russia in the NATO-Russia Council. OPINIE Vladimir Poetin heeft de wereld verrast in Oekraïne. De tijden van agressief revanchisme zijn terug in Europa, schrijft Arnout Brouwers in het commentaar van de Volkskrant. De Russische president Vladimir Poetin, onlangs nog gesignaleerd aan de toog met koning Willem Alexander, heeft voor het eerst sinds de door Slobodan Milosevic aangejaagde Balkanoorlogen, het fundament van de huidige Europese veiligheidsordening geschonden: de territoriale integriteit van staten. Het is op dit moment te vroeg om te zeggen of het Russische optreden in Oekraïne een invasie is van de Krim of heel oostelijk Oekraïne, of het begin van de creatie van nieuwe separatistische gebieden die - ook als er nooit een schot valt - zich feitelijk aan de Oekraïense soevereiniteit zuilen onttrekken. Maar nu al is duidelijk dat president Poetin een bom heeft gelegd onder de veiligheidsordening die na de instorting van de Sovjet-Unie in Europa is ontstaan. Poetin heeft nooit verborgen dat Oekraïne voor hem van lijfsbelang is. De Oekraïense Oranjerevolutie van tien jaar geleden was de aanleiding om de democratie in Rusland verder af te knijpen. in 2008 bij de Navo-top in Boekarest trok Poetin in twijfel of Oekraïne wel een staat is. En recent zette hij president Janoekovitsj onder grote druk om af te zien van een associatieverdrag met de EU. Want Poetins Euraziatische Unie stelt te weinig voor zonder Oekraïense deelname. Dit was allemaal bekend in het Westen, net zoals bekend was dat Poetin jarenlang de druk in Georgie’s afvallige provincies opvoerde tot hij in 2008 president Saakasjvili tot een aanval wist te provoceren - waarna Rusland binnenviel. Wat westerse politici - jarenlang ingepakt door bilaterale deals met Gazprom en in slaap gesust door hun eigen retoriek over Poetins Nieuwe Rusland’ - niet zagen aankomen, waren de gebeurtenissen van de afgelopen dagen, die herinneringen oproepen aan zowel het Sovjetingrijpen in Boedapest in 1956 ais aan Adolf Hitlers campagne om de ‘rechten van Duitsers’ te waarborgen in Sudetenland. Ook Poetins staatsrevanchisme over het verlies van het door Moskou bestuurde Sovjetrijk, lijkt op een echo uit het verleden. Maar willen de Russen op de Krim zelf niet bij Rusland? En kunnen we ais we een oogje dichtknijpen onze warme band met het Kremlin - en de gascontracten - niet bewaren? Zeker, de nieuwe overgangsregering in Kiev bevat enkele radicale types en heeft fouten gemaakt, vooral door de taalwet direct terug te draaien. Maar dit was geen westers complot en het is geen ‘fascistoïde bewind, hoezeer de Russische propaganda en Poetins al dan niet betaalde westerse apologeten dat ook betogen. Tot Rusland olie op het vuur gooide, stond niets een gezamenlijke Westers-Russische aanpak van de politieke en economische stabilisering van Oekraïne in de weg. Het is 2014, niet 1938 of 1956- en dat is waarom Poetins flagrante schending van de Oekraïense soevereiniteit als zo’n verrassing komt. De postmoderne Europeanen hebben hun eigen strijdkrachten al half afgeschaft, rekenen niet meer op militair tromgeroffel in Europa en kunnen alleen denken in termen van ‘win-win’-diplomatie. Bovendien heeft Poetin veel Europese leiders, de Nederlandse voorop, in zijn broekzak zitten ais gevolg van de jarenlange bilaterale opbouw van energieposities in bijna alle EU-markten. Hij wist dat hij er geen direct tegenspel te verwachten had. in zekere zin geldt dat ook voor het 'terugtrekkende’ Amerika, dat Rusland tot nu onmisbaar achtte in onder meer zijn Iran-diplomatie. Poetin kan dus een de facto inlijving van de Krim, en zelfs delen van Oost-Oekraïne, afdwingen. Het valt zeer te hopen dat de wereldgemeenschap hem nog kan intomen en een hete oorlog in Oekraïne voorkomen kan worden. Maar ongeacht wat volgt: Poetin is de Rubicon overgetrokken. Dat betekent dat alle betrokkenen de balans moeten opmaken van hun relatie met dit Russische bewind. Dat geldt ook voor Nederland als de facto bruggenhoofd voor Gazprom en veilige kluis voor criminele miljarden uit Rusland. Arnout Brouwers is chef opinie van de Volkskrant.